Researchers have shown that when teachers are more motivated, they tend to experience greater workplace wellbeing and their students tend to report greater motivation and attain higher levels of achievement. Notably, teachers can be motivated in positive ways that support positive classroom outcomes, or they can be motivated in negative ways that are a barrier to positive outcomes (Martin, 2009). Here, we summarise findings from our research on the positive and negative dimensions of teacher motivation, published recently in the journal Teaching and Teacher Education (Collie & Martin, 2017). In our study, we wanted to identify major motivational profiles among teachers and examine the effect of different motivational profiles on teachers’ wellbeing. Taken together, the results shed light on how teachers are motivated to do their work, and the implications for their workplace wellbeing. Self-efficacy – teachers’ judgements of their ability to do well in their work. Valuing – teachers’ perceptions of the importance, usefulness, and relevance of their work. Mastery orientation – teachers’ goals towards developing competence and knowledge in teaching skills. Anxiety – feelings of tension or worry that occur when teachers think about or do their work. Uncertain control – teachers’ uncertainty about how to control or achieve particular outcomes at work. Performance avoidance – teachers’ desire to avoid doing poorly or disappointing others at work. Work enjoyment – teachers’ satisfaction or enjoyment of their teaching work. Workplace buoyancy – teachers’ capacity to effectively navigate challenges and setbacks that are characteristic of the everyday work environment (for example, competing deadlines, pressure, and demanding tasks). Work disengagement – teachers’ inclination to give up in their work. What motivational profiles did we find? The data was from 519 teachers in Australian primary and secondary schools. Participants completed a survey about their motivation and wellbeing. Our analyses revealed five distinct motivational profiles. Teachers in the first group reported very high positive motivation (self-efficacy, valuing, mastery) and below average negative motivation (anxiety, performance avoidance, uncertain control). These teachers appear to have a very healthy motivational profile; they know what needs to be done in order to succeed in their work (low uncertain control), and they are not anxious or inclined towards performance avoidance strategies. These teachers are oriented towards success. The second group showed above average self-efficacy, valuing, and mastery orientation, as well as below average uncertain control, anxiety, and performance avoidance. Teachers in this group show healthy motivation with respect to the positive motivation factors, they do not lack perceived control, are not overly anxious, and are not inclined towards performance avoidance strategies. As such, they appear to be focused on seeking success in their work. Teachers in this group reported levels of positive and negative motivation that were all below average. These teachers are not fearful of poor performance (low anxiety, performance avoidance) and do not lack perceived control. However, they have below average self-efficacy, do not strongly value their teaching work, and are not mastery oriented. Thus, these teachers appear to be unmotivated. This group showed below average self-efficacy and valuing, average mastery orientation, but high uncertain control, anxiety, and performance avoidance. As such, teachers in this group appear fearful of and anxious about failing in their work and do not have high levels of positive motivation. This reflects a failure fearing profile. The final group showed very low levels of the positive motivation factors (self-efficacy, valuing, mastery), above average uncertain control, and below average anxiety and performance avoidance. In other words, teachers in this group lack self-efficacy, valuing of work, and a mastery orientation. They appear to have accepted failure or ‘given up’ to the point of not being anxious about their work. Taken together, our study revealed five major groups of teachers who differ in terms of their motivational profiles. Next, we were interested in determining whether these groups are associated with any differences in the wellbeing outcomes. Are the profiles linked with wellbeing differently? 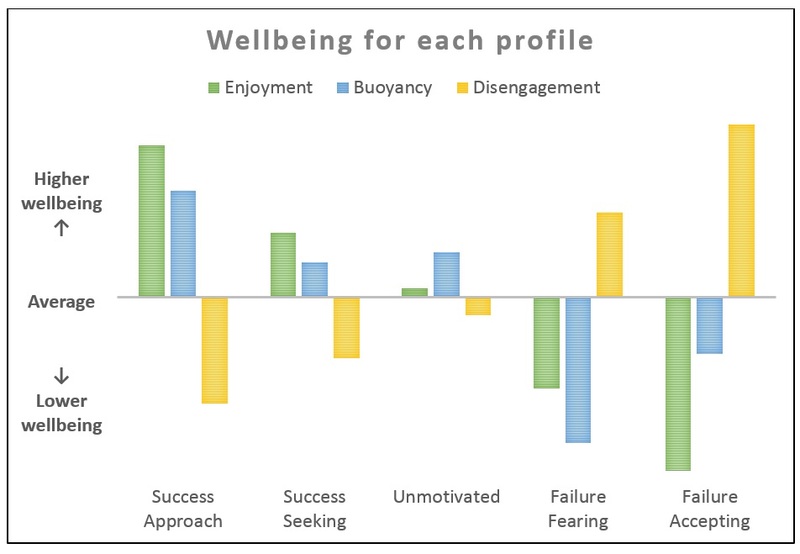 When comparing the profiles on the wellbeing outcomes, there were some interesting findings as shown in the graph below. Work enjoyment: The highest levels of work enjoyment were reported by the success approach profile, followed by the success seeking, unmotivated, failure fearing, and finally the failure accepting profile. Workplace buoyancy: The highest levels of workplace buoyancy were reported by the success approach profile. This was followed by the unmotivated and success seeking profiles who showed similar levels. The failure accepting profile came next, followed lastly by the failure fearing profile. Work disengagement: The results for work disengagement were opposite to work enjoyment. That is, the lowest levels were reported by the success approach profile, followed by the success seeking, unmotivated, failure fearing, and finally the failure accepting profile. Taken together, the success approach and success seeking profiles tended to have the most positive outcomes, followed by the unmotivated profile, and then the failure fearing and failure accepting profiles. We believe the positive outcomes linked with the two success-related profiles likely occurred because these teachers have confidence in their abilities, they value their work, and they are motivated to develop mastery in their work. These are all important for feeling happy and doing well at work. At the same time, these teachers are not overly anxious, they feel a sense of control in their work, and they are not overly motivated by the need to avoid performing poorly. An unexpected finding concerned workplace buoyancy and the fact that the failure fearing profile fared worse than the failure accepting profile on this wellbeing outcome. As noted above, it is possible that teachers in the failure accepting group have ‘given up’ and so they may no longer be affected by the pressure that is typical of teaching work. In contrast, teachers in the failure fearing profile appear to be afraid of poor performance, meaning that everyday setbacks at work may be much harder for them to successfully navigate. What do the findings mean for teachers and principals? Our findings highlight that teacher motivation is an important issue that deserves attention in research and practice. The findings also highlight the specific positive and negative motivation factors that make a difference to teachers’ wellbeing. Effective professional development is one key way in which to promote positive motivation among teachers. At the same time, our findings indicate that it is also important to reduce negative motivation. Professional development that only focuses on improving positive motivation may fail to address underlying issues with negative motivation. For example, although helping teachers to build their self-efficacy is critical, such efforts may not be effective in the long-term if teachers lack perceived control, feel anxious, or fear poor performance. Khourey-Bowers, C., & Simonis, D. G. (2004). Longitudinal study of middle grades chemistry professional development: Enhancement of personal science teaching self-efficacy and outcome expectancy. Journal of Science Teacher Education, 15, 175-195. Martin, A. J. (2009). Motivation and engagement in the workplace: Examining a multidimensional framework and instrument from a measurement and evaluation perspective. Measurement and Evaluation in Counseling and Development, 41, 223-243. As a school leader, what support mechanisms and professional development opportunities have you put in place to help teachers build their self-efficacy? Do you have a staff wellbeing policy? As a teacher, what worries or fears do you have about your work, role, or performance? Have you discussed these feelings with anybody? Do you regularly set aside time to focus on your own wellbeing? Thank you for sharing this. It gives a lot of food for thought as a school leader. I will certainly spend time going over it and looking for ways to help my teachers achieve higher levels of satisfaction and enjoyment in their work. Thank you for sharing this study. It is really valuable and addresses major dimensions which are usually not researched seriously compared to teaching practices and cognitive abilities of teachers rather than talking about their well being at a school. I am interested in designing similar study in Lebanon due to the high unsatisfactory level reported by teachers.